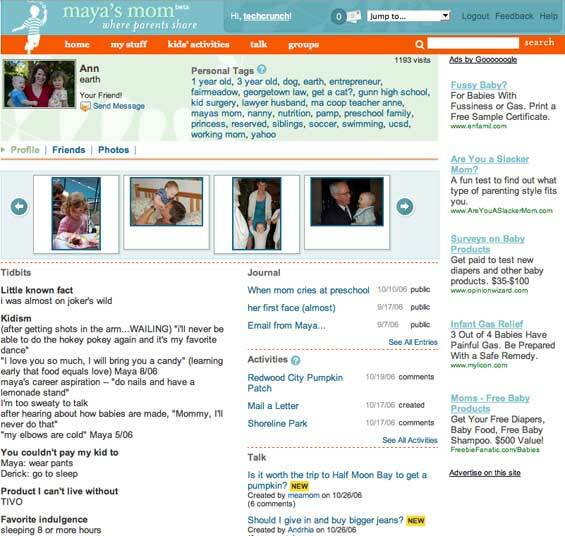 Palo Alto based Maya’s Mom is a sort of Yahoo Answers plus Facebook, for parents, that we previously announced back in April. The site went live yesterday and already has fairly deep content. Other companies are addressing the parenting/family social network opportunity as well (we’ve covered Minti, Famster and FriendsForFamilies). But Maya’s Mom is focused on allowing users to request and offer advice to others first, and more traditional social networking features second. The heart of Maya’s Mom is their “Talk” section. Rather than following the article format of Minti, Maya’s Mom allows you to post about any questions you have publicly, anonymously, or to specific friends. Users can subscribe to the most recent questions via RSS. Questions are grouped by tags and analyzed for duplicates when submitted. You can search for answers by keyword or tag. If someone has already posted a question like yours, Maya’s Mom will direct you toward their answer. Like activities, you can also create list and be alerted when new answers to your questions arrive. The company boasts a strong group of initial investors from a recent “around $1 million” angel round – True Ventures, Jeff Clavier, James Currier, Caterina Fake, Geoff Ralston, Raymond Stern, and Michael Tanne. The Maya’s Mom blog is here. And if you are wondering about the name of the company – Maya is founder Ann Crady’s daughter. I wonder if Ann’s son Derick will someday feel less loved because the site isn’t named in his honor instead.